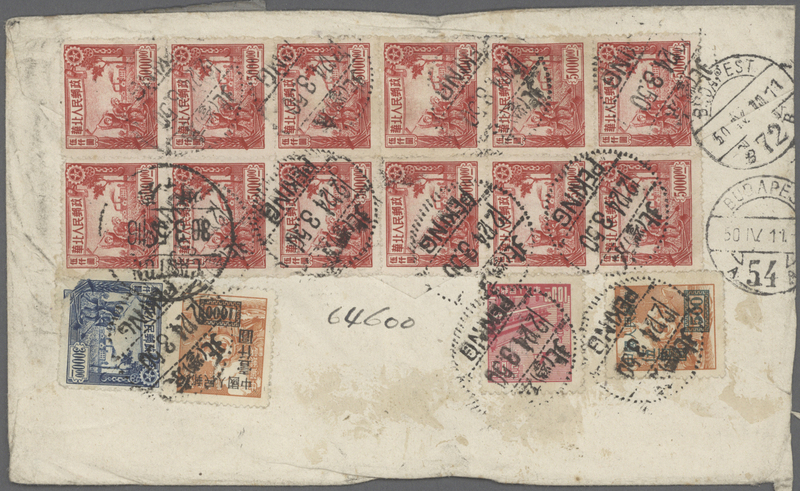 5071 ungebraucht ohne Gummi (unused without gum) (*) 1-12 North China, 1949, "North China People's Post", ovpt. 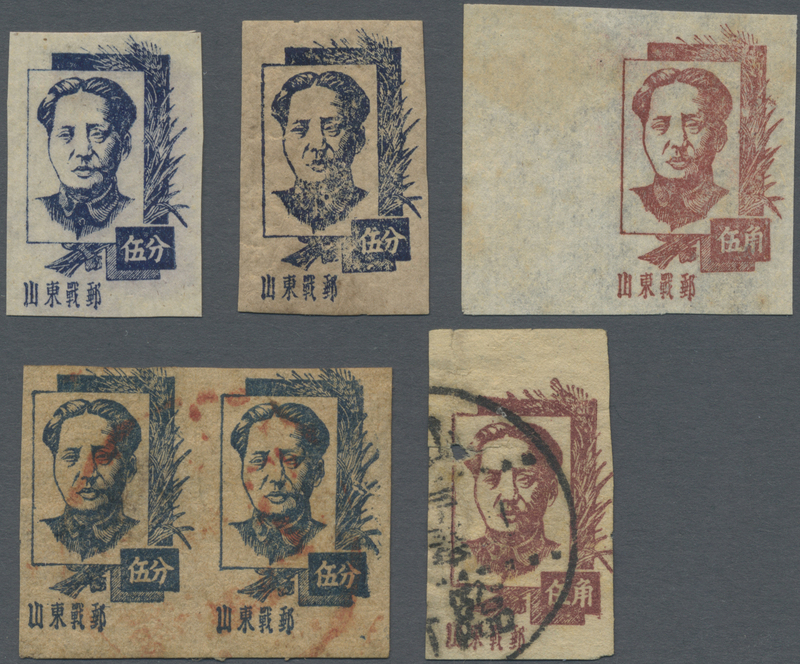 $1/$60 - $12/$2003, unused no gum as issued, $1/$60 with a small vertical crease, otherwise condition far above average, very rare set (Yang NC307-319). 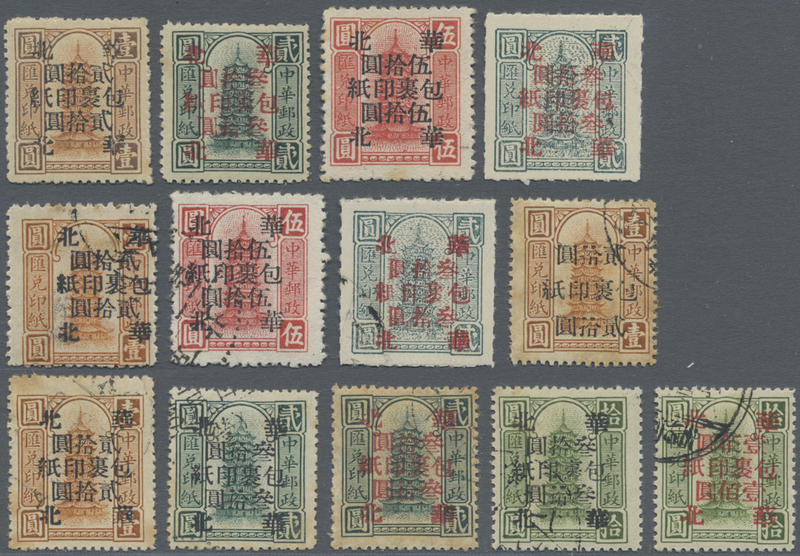 5072 gestempelt (marked) 1, 3-6, 8, 10-12 North China, 1949, "North China People's Post" ovpt., used selection, fine to very fine, total 10 copies (Yang NC307-310, NC312, NC314, NC316-319). 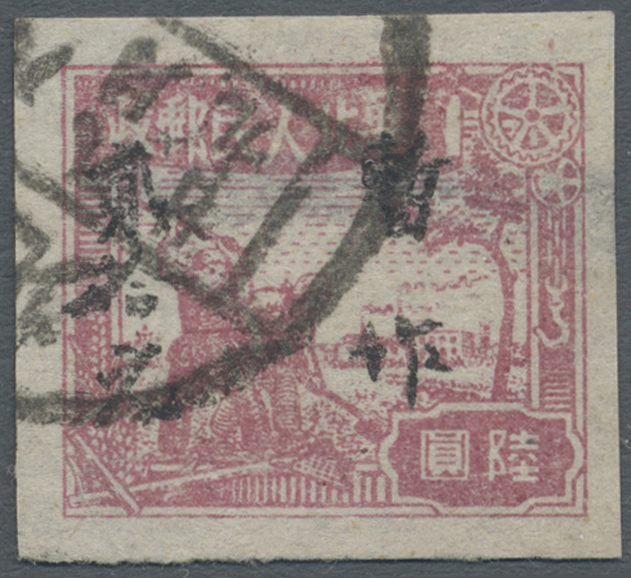 5073 gestempelt (marked) 7 North China, Taiyue District, 1949, "Temporarily Used for" ovpt., $8/$3, used, fine, (Yang LNC6). 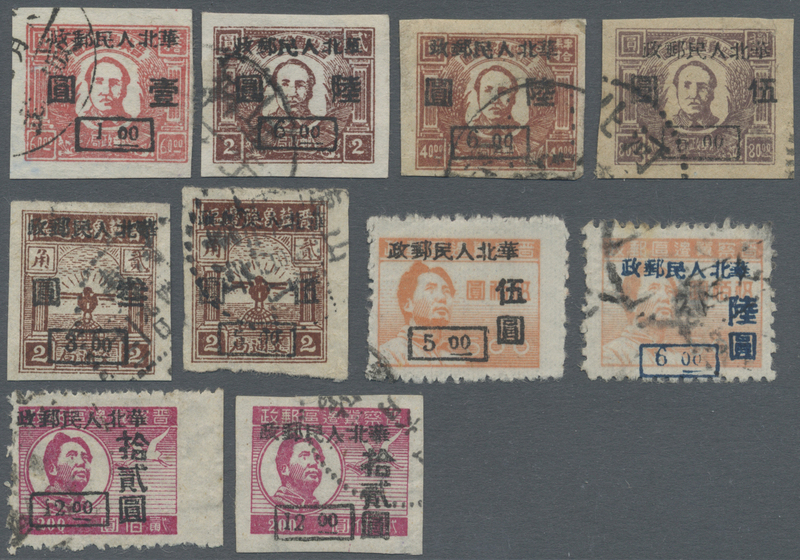 5074 gestempelt (marked) 6 North China, Taihang, 1949, "Temporarily Used for" ovpt., $20/$6, used, some thins (Yang LNC7). 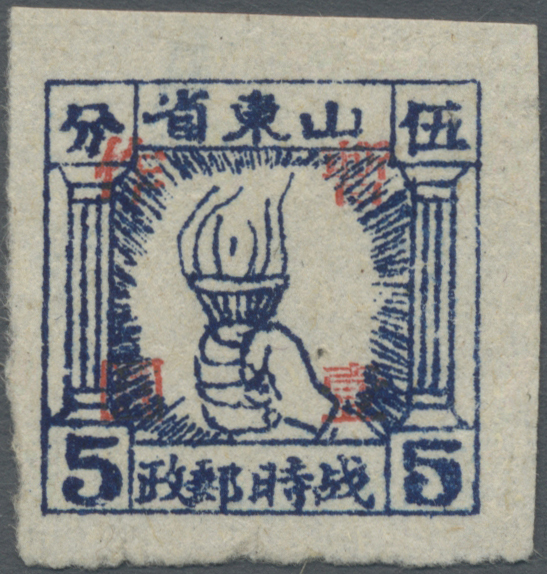 5075 gefälligkeitsgestempelt (complaisance-marked) 12-20 North China, Beijing, 1949, "North China People’s Post" ovpt., $300/$6.000.000 - $1.000/$3.000.000, $6/$5 - $100/$10, 2 cpl. 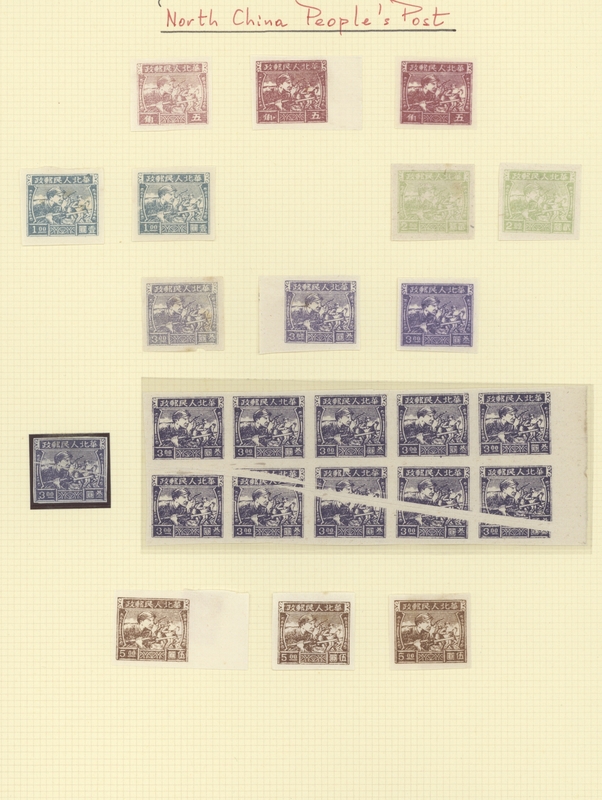 sets, total 9 copies, CTO, some toning (Yang NCP1-9). 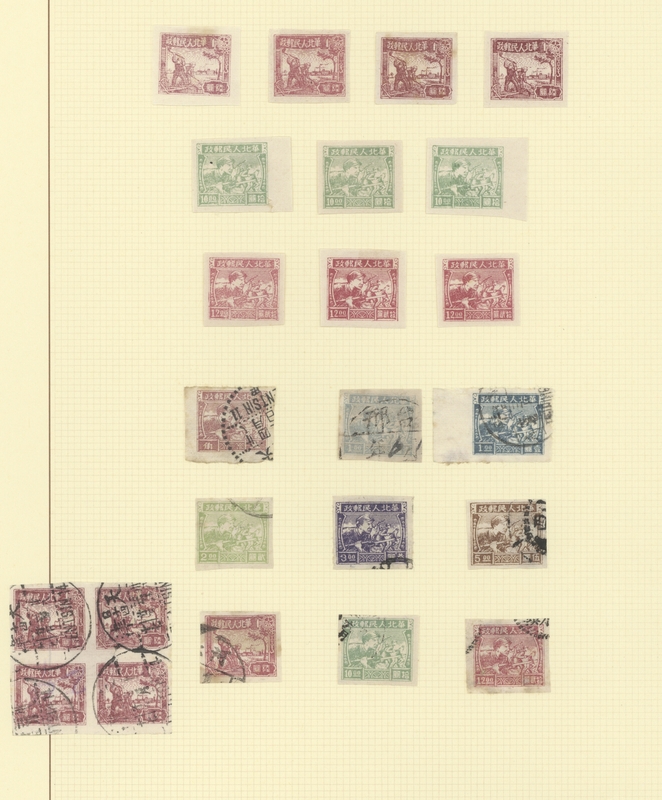 5076 ungebraucht ohne Gummi (unused without gum) (*) 21-27 North China, Beijing, 1949, "Train Parcel Post", $500 - $50.000, cpl. 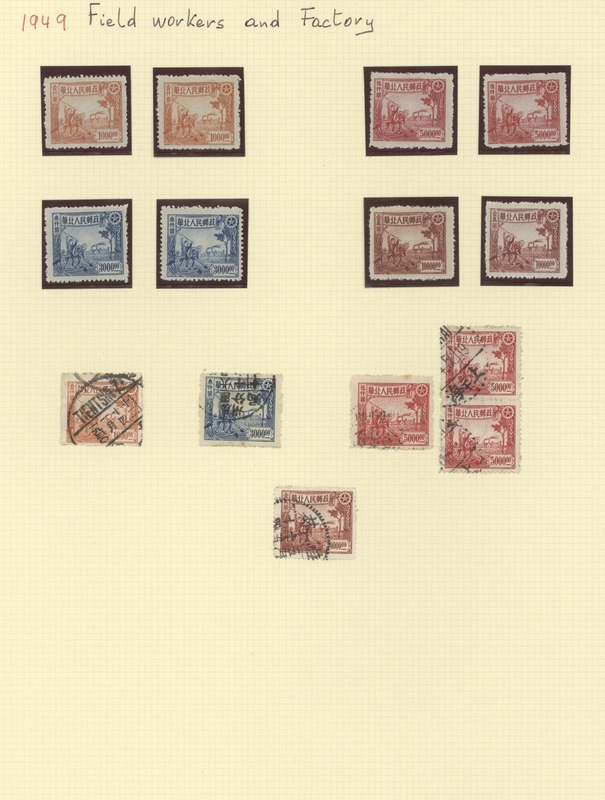 set of 7, unused no gum as issued, $10.000 with small wrinkle otherwise very fine, very rare set (Yang NCP10-16). 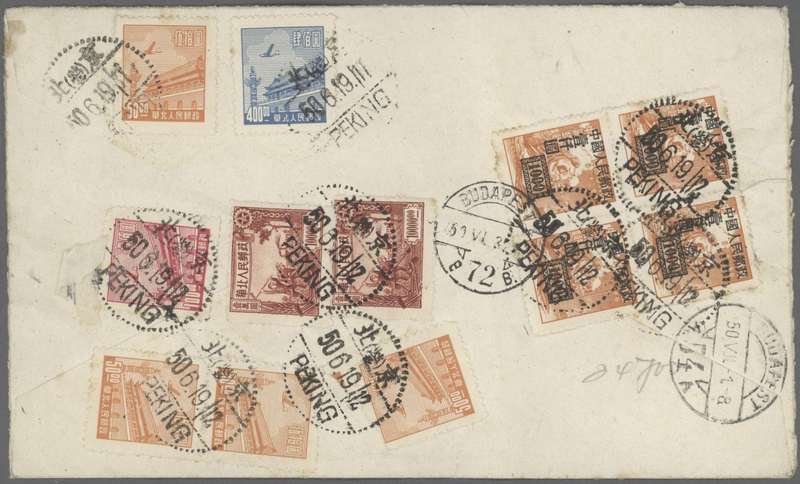 5077 gefälligkeitsgestempelt (complaisance-marked) 1-7 North China, Tianjin, 1949, "Parcel Post" or "North China / Parcel Post", $20/$1 - $100/$10, assembly of 13, used and unused copies, some tonings (Yang NCP17-26, ex. 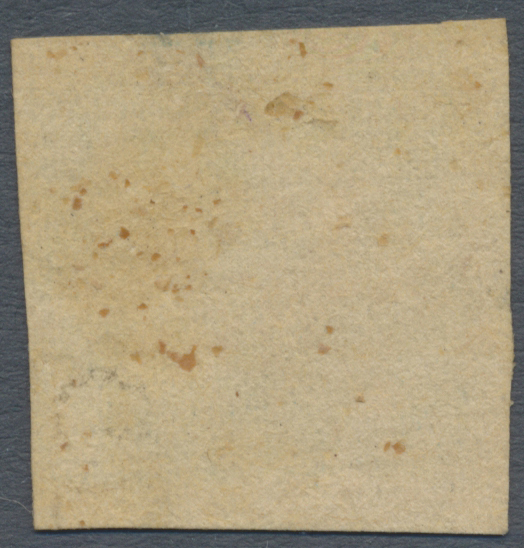 NCP24). 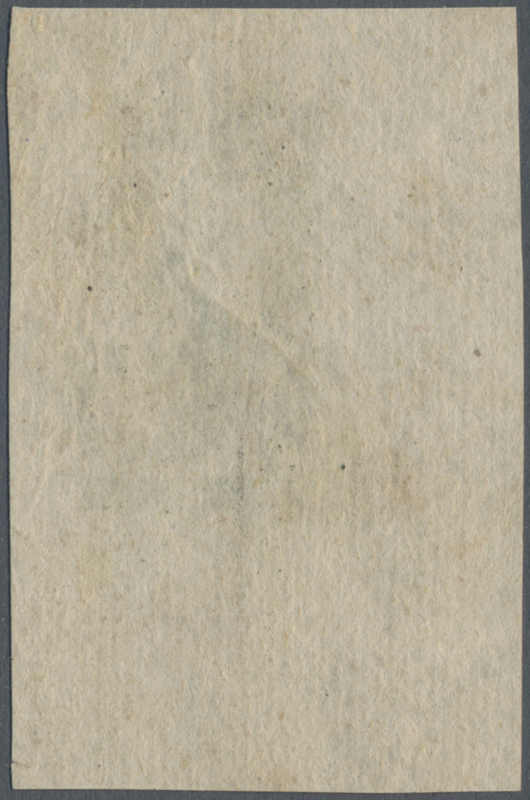 5078 gefälligkeitsgestempelt (complaisance-marked) 8-11 North China, Tianjin, 1949, "Post and Telecommunications Service of North China Temporarily Used for", $500/$3.000.000 - $5.000/$10.000.000, cpl. 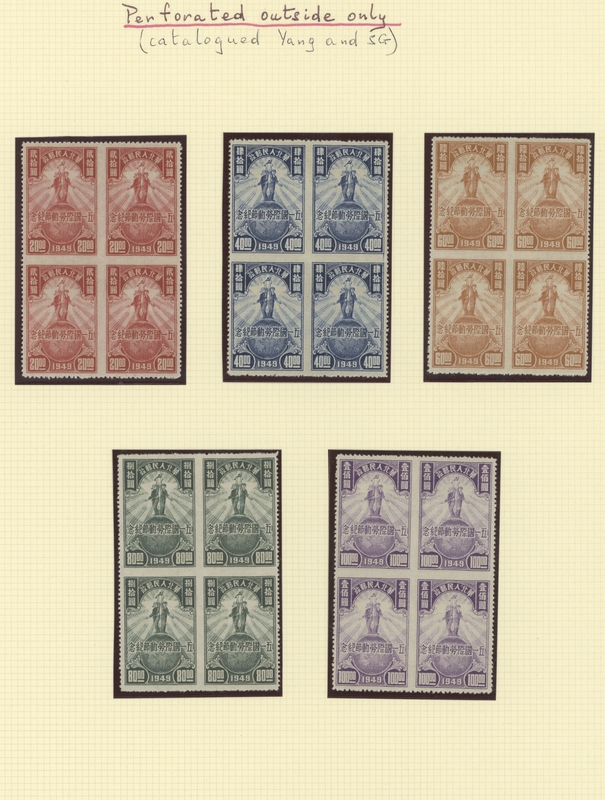 set of 4, CTO, $500/$3.000.000 some light toning otherwise very fine, a rare set (Yang NCP27-30). 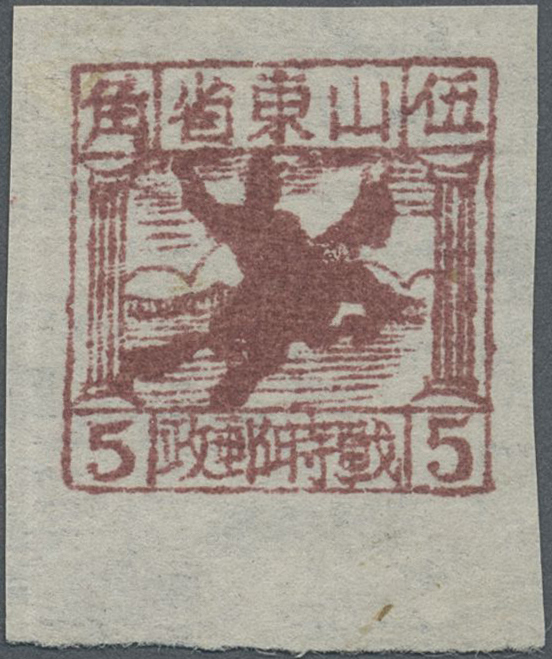 5079 ungebraucht ohne Gummi (unused without gum) (*) 17-24 North China, Shanxi-Hebei-Shandong-Henan Border Area, 1946, "MP Paper Issue", $10 - $20000, cpl. 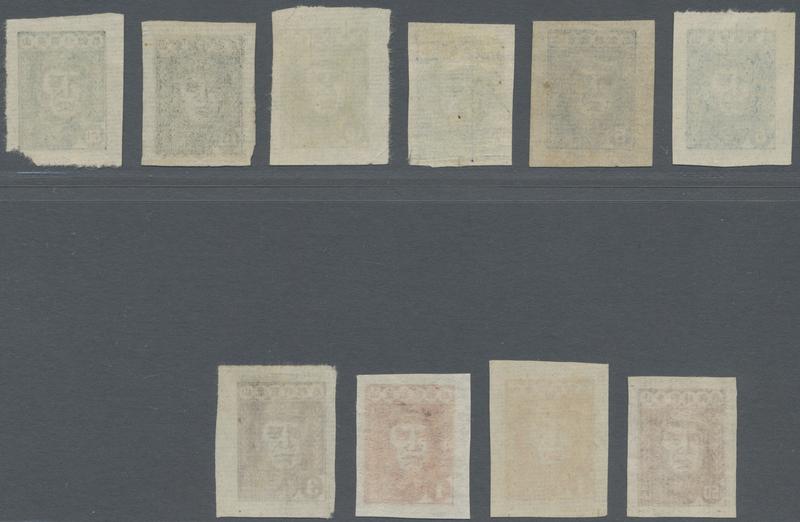 set of 8, unused no gum as issued, very fine, a rare set (Yang NCM17-24). 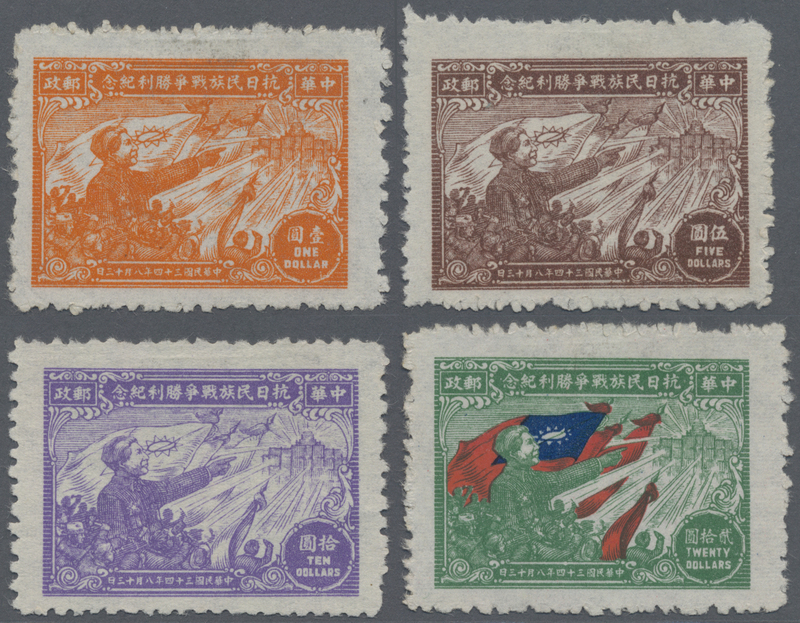 5080 ungebraucht ohne Gummi (unused without gum) (*) gestempelt (marked) North China, "North China People's Post", 1949, larger selection ex NC320-413, mint + used, fine to very fine, incl. 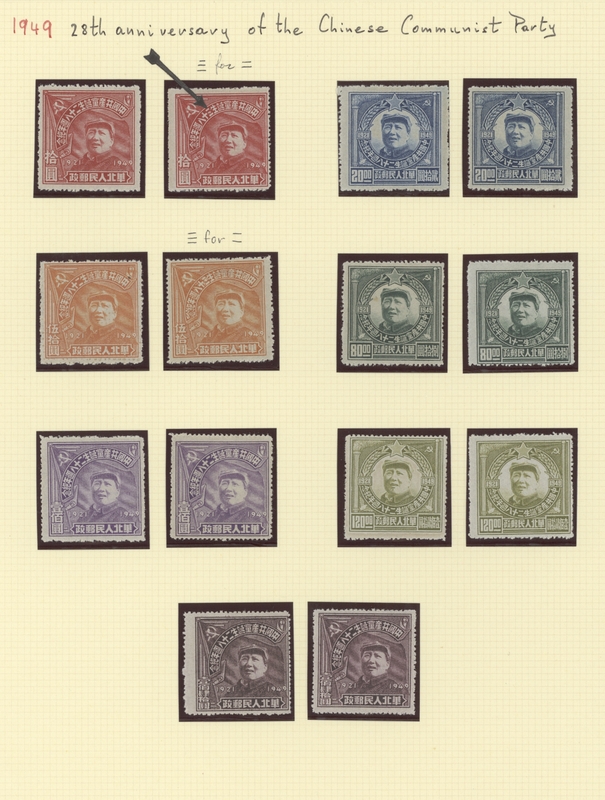 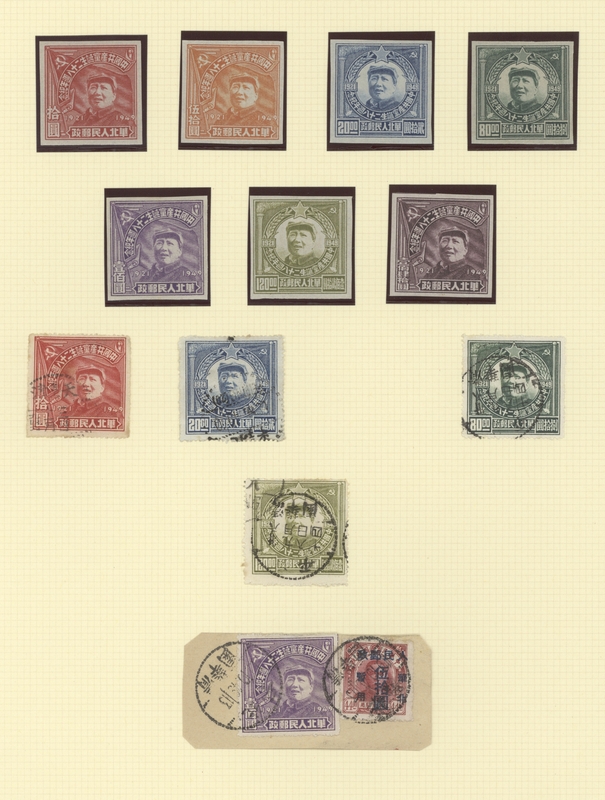 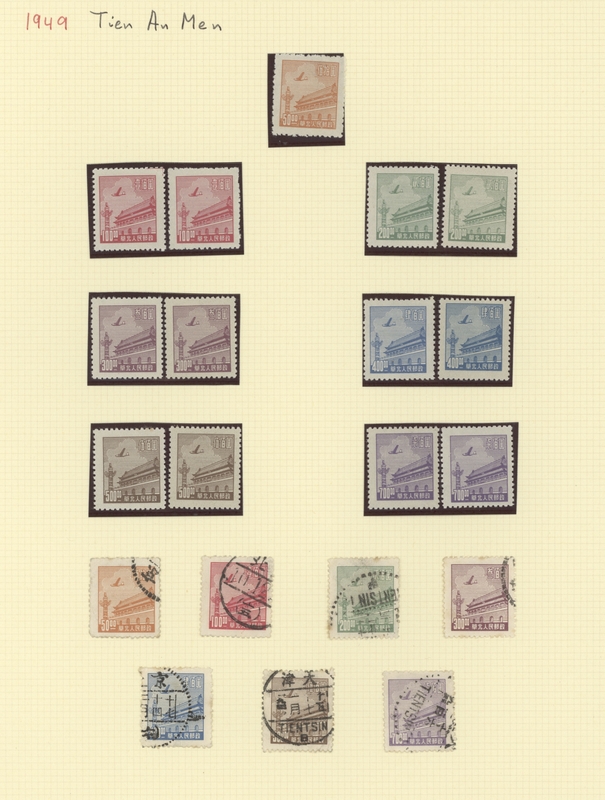 pairs, blocks and varieties, remarkable copies of 5 imperf. 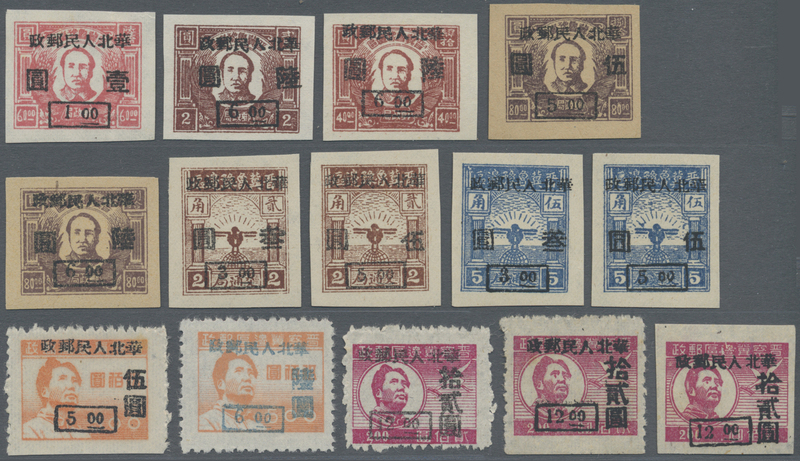 blocks of 4, perforated on the outside edges (Yang NC380) and a rare first print surcharge of $200/$4 (Yang NC398), approx. 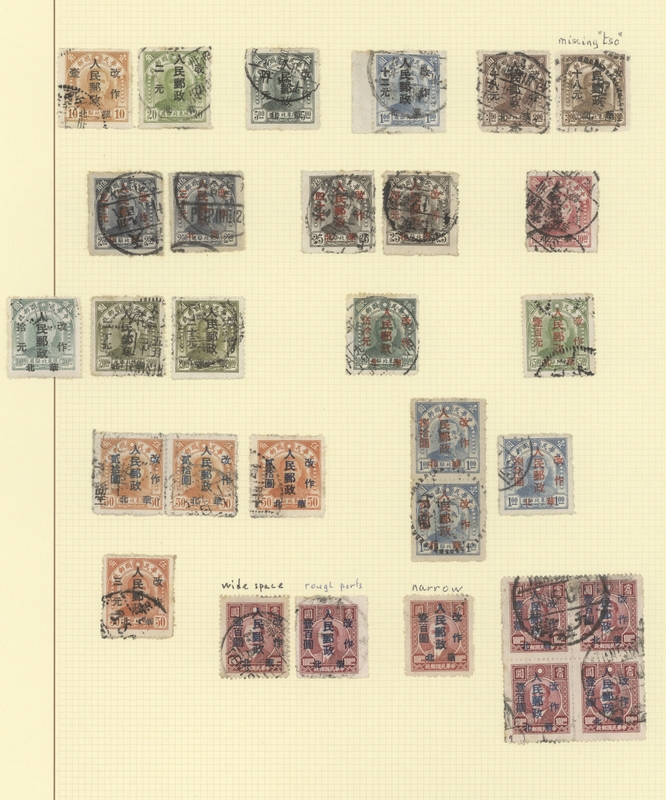 226+ copies plus 3 commercial covers (these with faults). 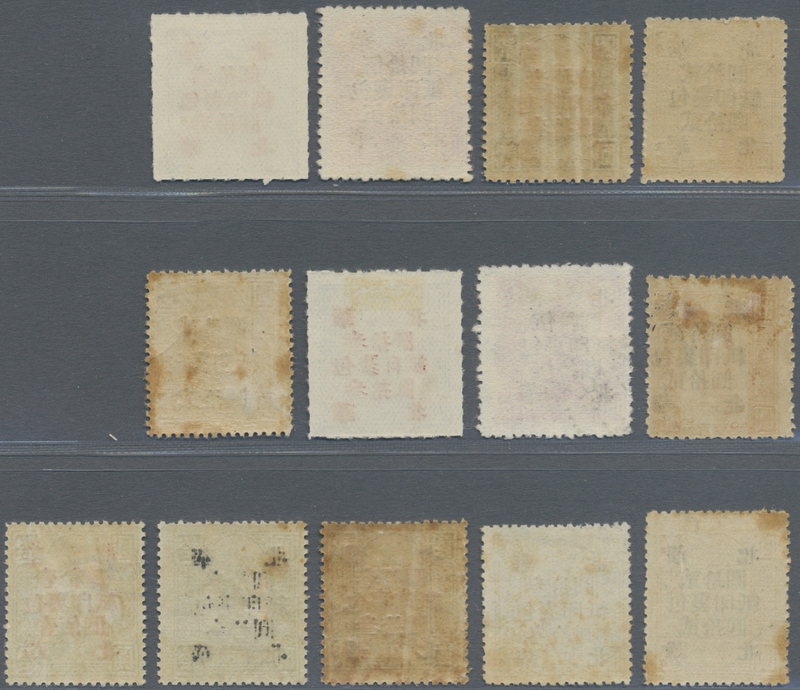 5081 ungebraucht ohne Gummi (unused without gum) (*) East China, Shandong Area, 1942, "2nd Print Square Stamps of Shandong Wartime Posts", 2c (newsprint paper, type A) - 5c (type B, type D), unused no gum as issued, 2c and 5c (type D) small hinge remnant, very fine (Yang EC7a, EC8b, EC8d). 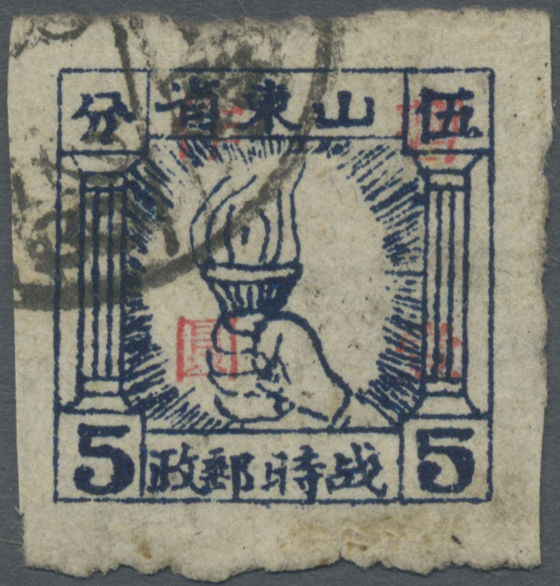 5083 gestempelt (marked) East China, Shandong Area, 1942, "2nd Print Square Stamps of Shandong Wartime Posts", 5c (type C), used, fine (Yang EC8c). 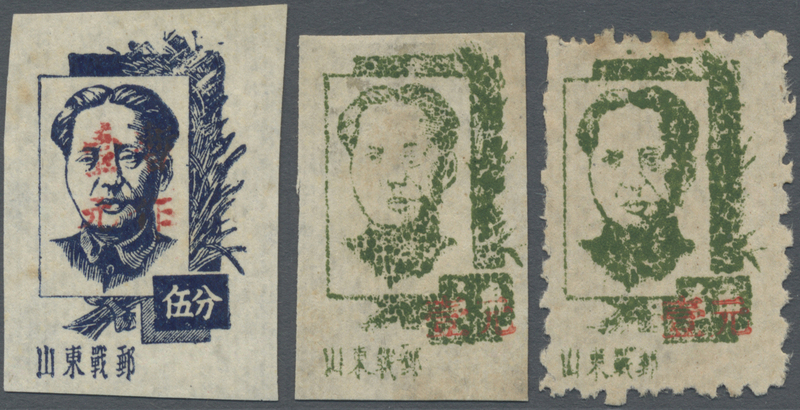 5084 ungebraucht ohne Gummi (unused without gum) (*) East China, Shandong Area, 1942, "2nd Print Square Stamps of Shandong Wartime Posts", 10c (type B), unused no gum as issued, small hole in center repaired, cut into design at right, still a very rare and desirable stamp (Yang EC9a). 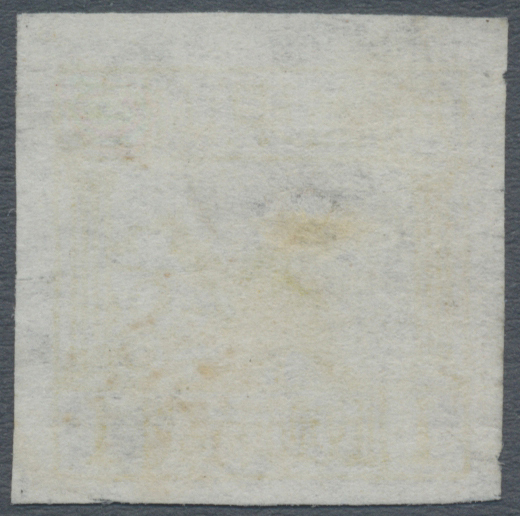 5085 ungebraucht ohne Gummi (unused without gum) (*) East China, Shandong Area, 1942, "2nd Print Square Stamps of Shandong Wartime Posts", 10c (type D), unused no gum as issued, very fine (Yang EC9c). 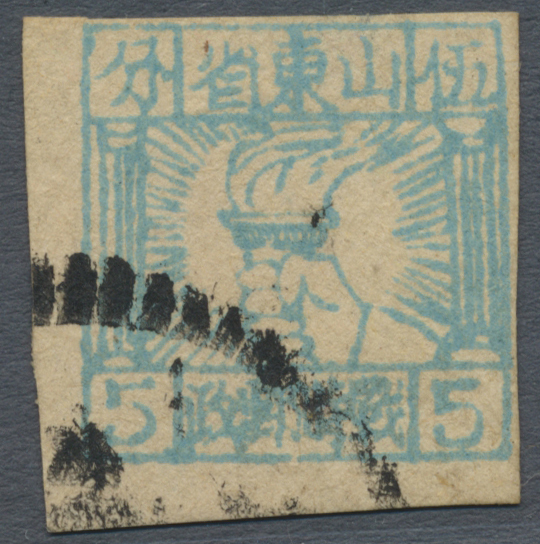 5086 ungebraucht ohne Gummi (unused without gum) (*) East China, Shandong Area, 1942, "2nd Print Square Stamps of Shandong Wartime Posts", 50c (type C), unused no gum as issued, fine (Yang EC11b). 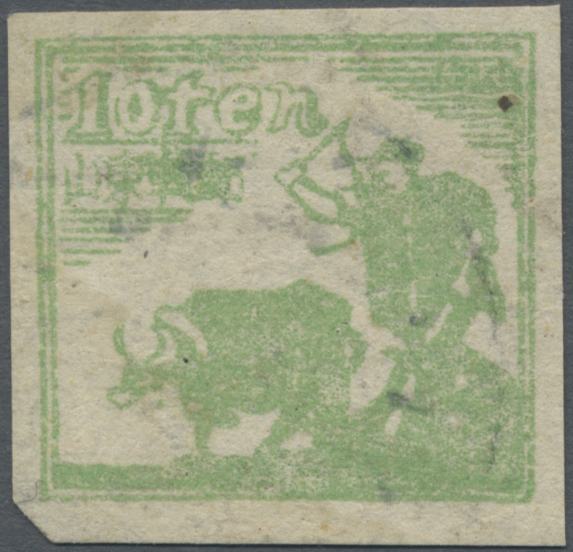 5087 ungebraucht ohne Gummi (unused without gum) (*) East China, Shandong Area, 1942, "2nd Print Square Stamps of Shandong Wartime Posts", 50c (type D), unused no gum as issued, very fine (Yang EC11c). 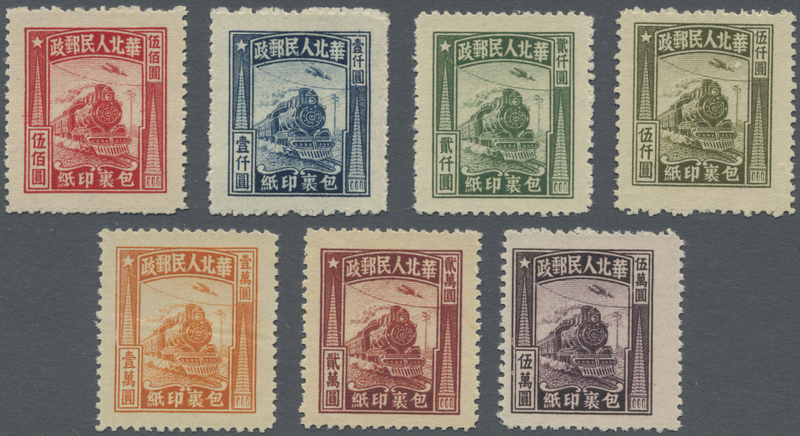 5088 ungebraucht ohne Gummi (unused without gum) (*) East China, Shandong Area, 1945, "2nd Print Square Stamps of Shandong Wartime Posts ovpt. 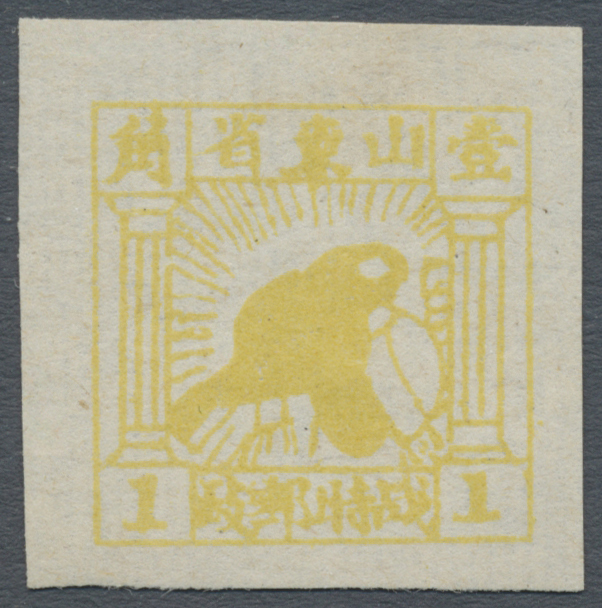 Temporarily Used for", $1/5c, unused no gum as issued, very fine (Yang EC17). 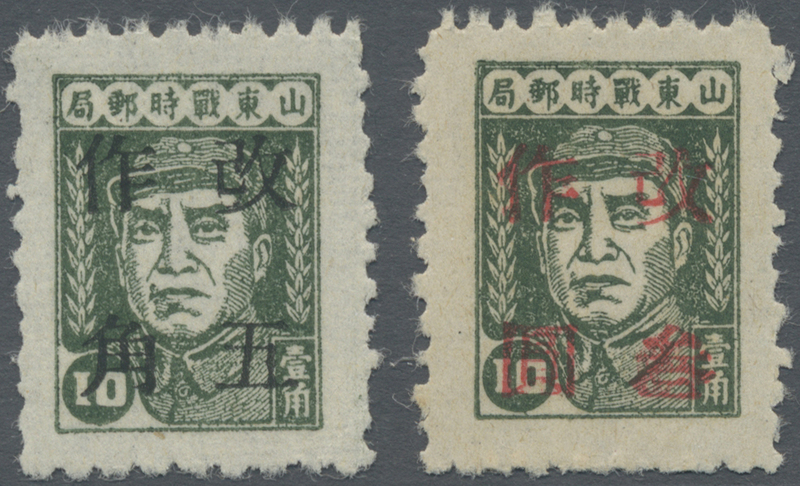 5089 gestempelt (marked) East China, Shandong Area, 1945, "2nd Print Square Stamps of Shandong Wartime Posts ovpt. 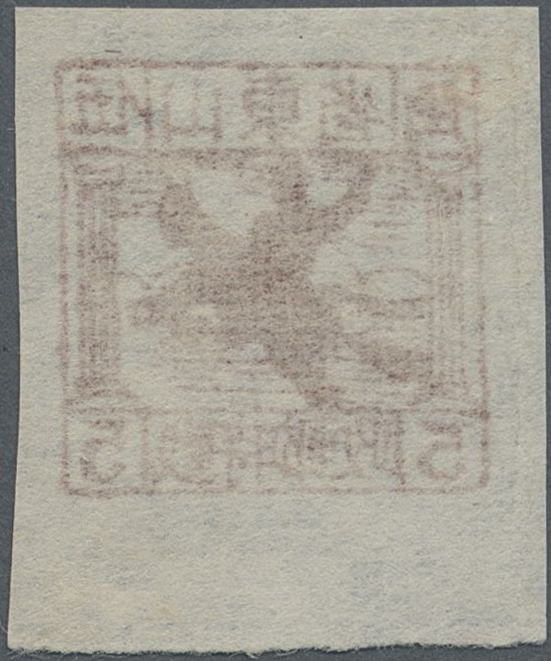 Temporarily Used for", $1/5c, used, fine (Yang EC17). 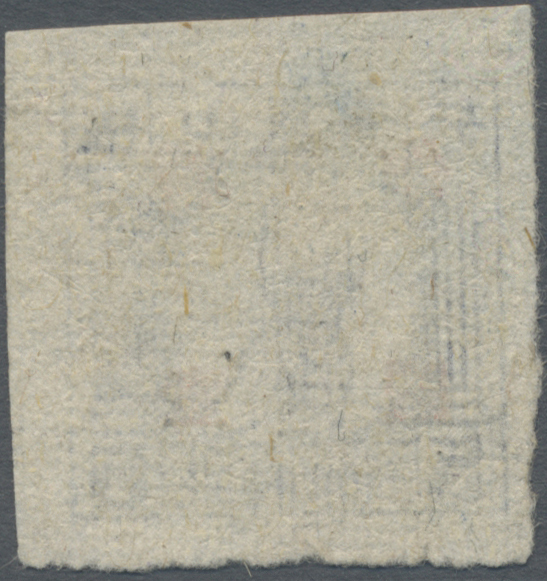 5090 ungebraucht ohne Gummi (unused without gum) (*) gestempelt (marked) East China, Shandong Area, 1945, "2nd Print Square Stamps of Shandong Wartime Posts ovpt. 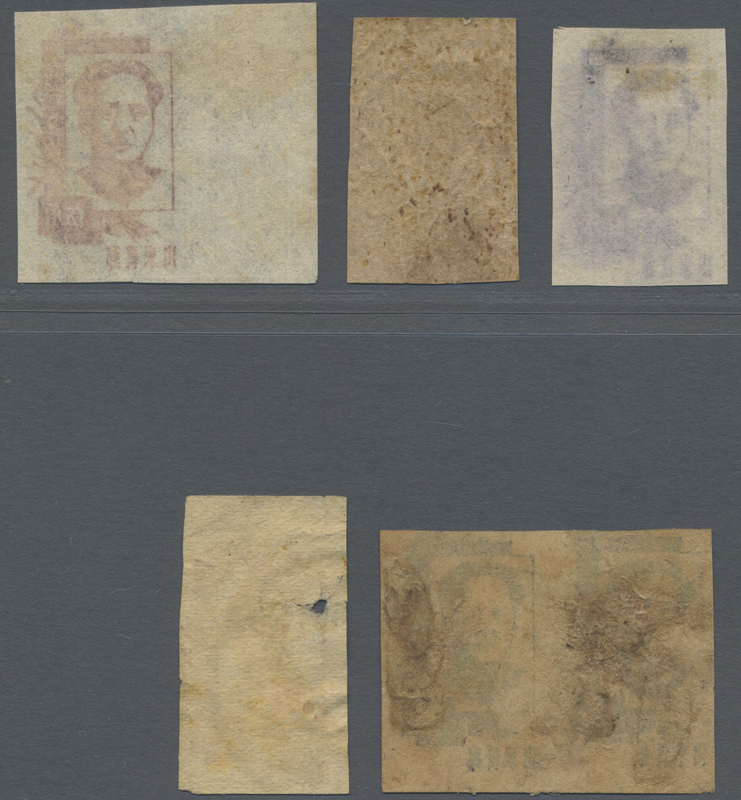 Temporarily Used for", $5/5c, unused no gum as issued, very fine plus a used sample, here some thins (Yang EC18). 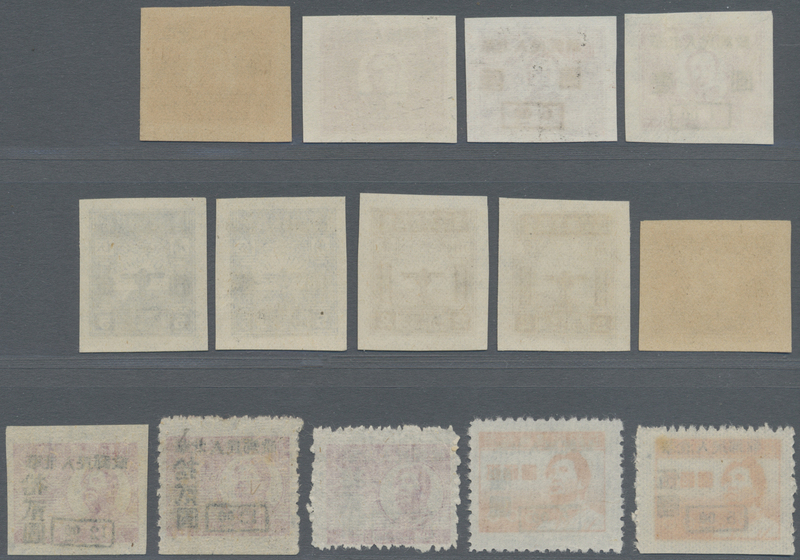 5091 ungebraucht ohne Gummi (unused without gum) (*) gestempelt (marked) East China, Shandong Area, 1945, "Mao Zedong Issue of Shandong Wartime Post (1st Print)", 5c (white / newsprint paper), 50c, unused no gum as issued, fine, plus 3 used samples (5c pair fine, 50c this with faults) (Yang EC19, EC21-22). 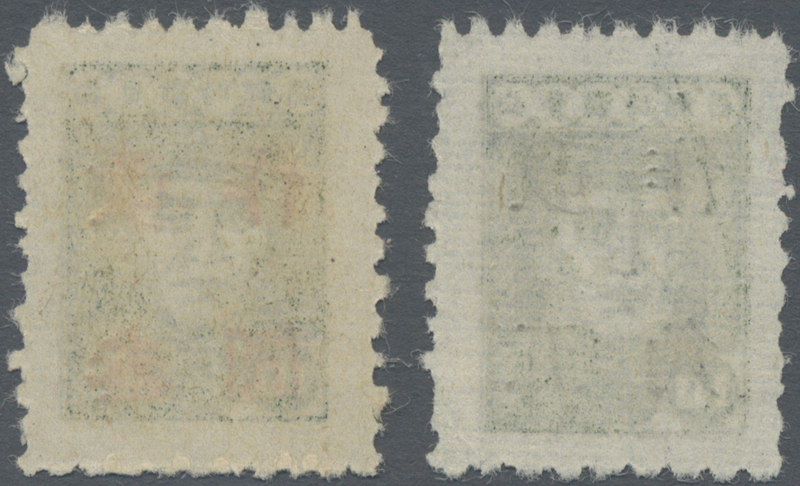 5092 ungebraucht ohne Gummi (unused without gum) (*) East China, Shandong Area, 1945, "Mao Zedong Issue of Shandong Wartime Post (1st Print)", 10c, unused no gum as issued, very fine (Yang EC20). 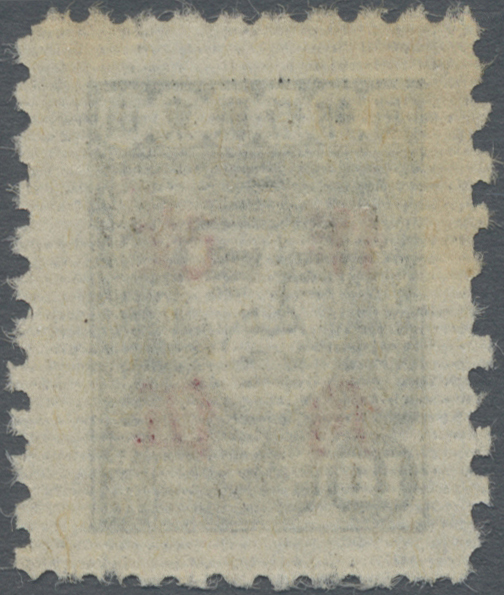 5093 ungebraucht ohne Gummi (unused without gum) (*) East China, Shandong Area, 1945, "Mao Zedong Issue of Shandong Wartime Post (2nd Print)", 10c - 50c, cpt. 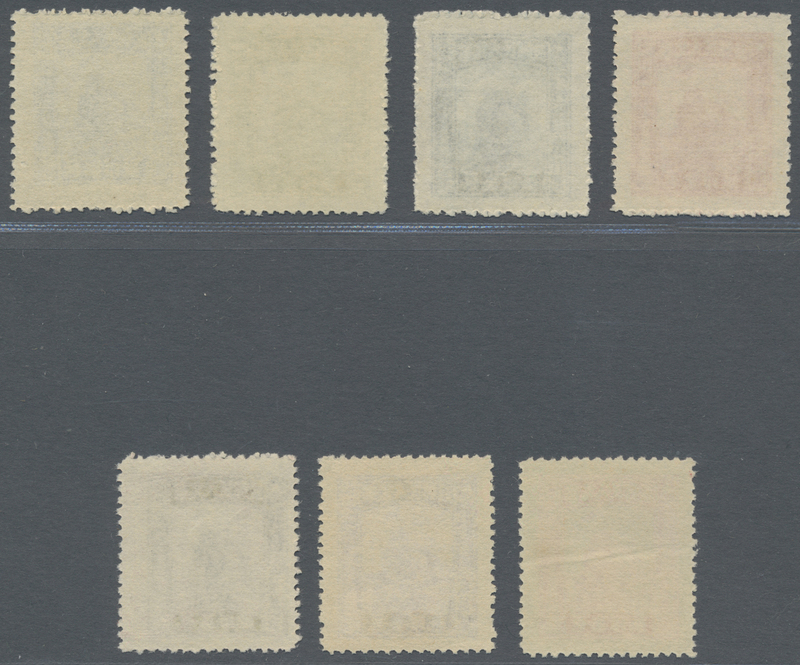 set of 2, unused no gum as issued, fine to very fine, total 6 copies (Yang EC24-25, EC25a). 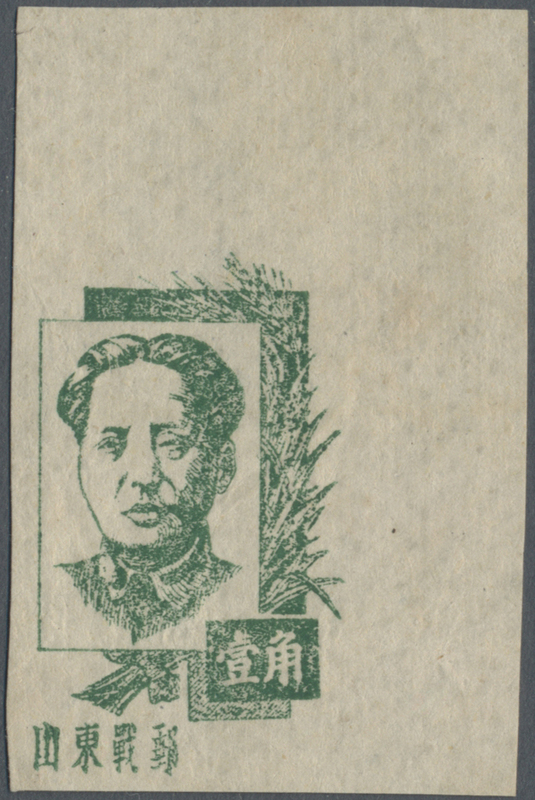 5094 ungebraucht ohne Gummi (unused without gum) (*) East China, Shandong Area, 1944-47, "Mao Zedong Issue of Shandong Wartime Post ovpt. 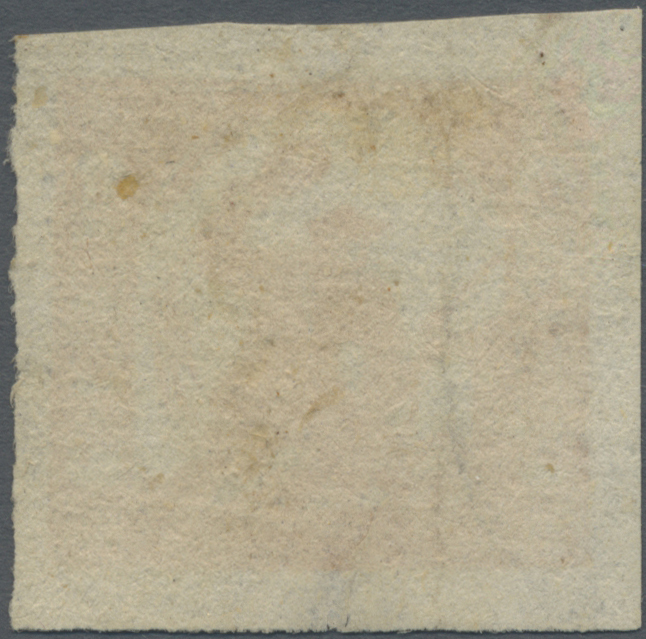 with new value", $1/5c, $1/10c (imperf. 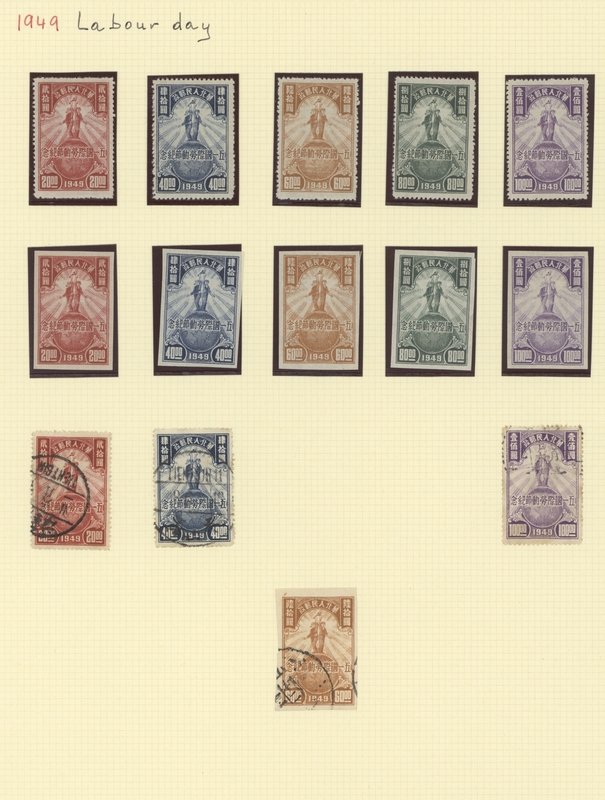 / perf. 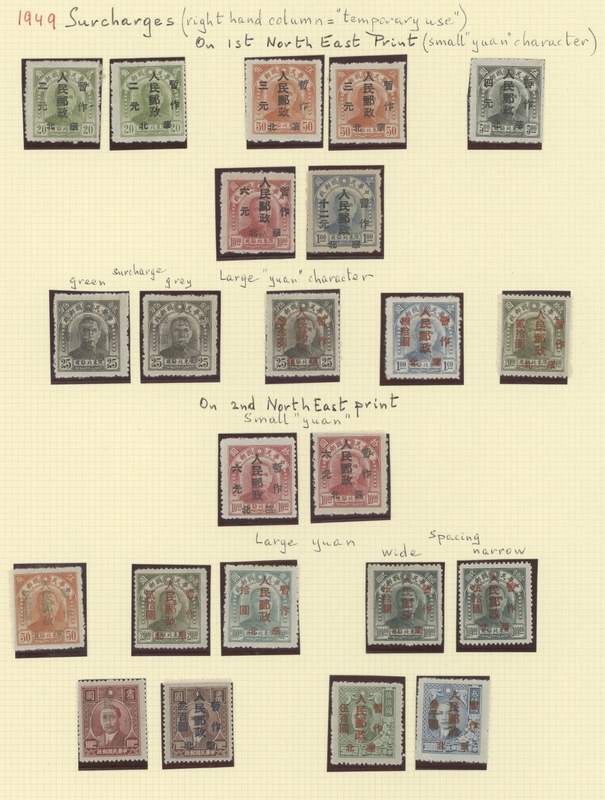 ), unused no gum as issued, some toning spots otherwise fine to very fine, total 3 copies (Yang EC27, EC35). 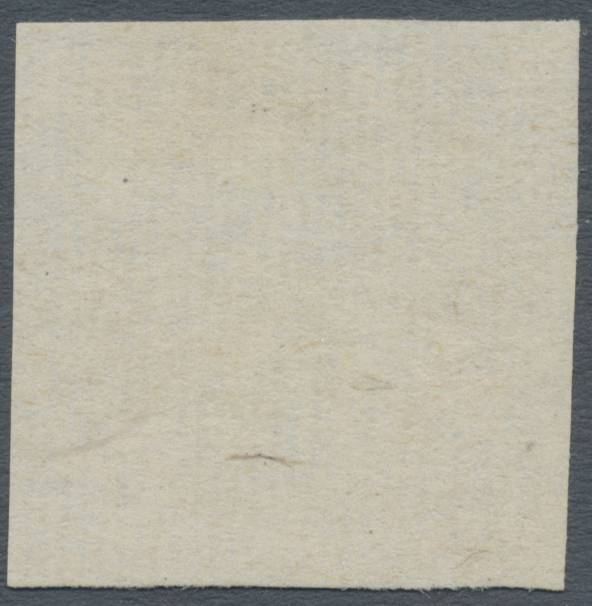 5095 ungebraucht ohne Gummi (unused without gum) (*) East China, Shandong Area, 1944-47, "Mao Zedong Issue of Shandong Wartime Post ovpt. 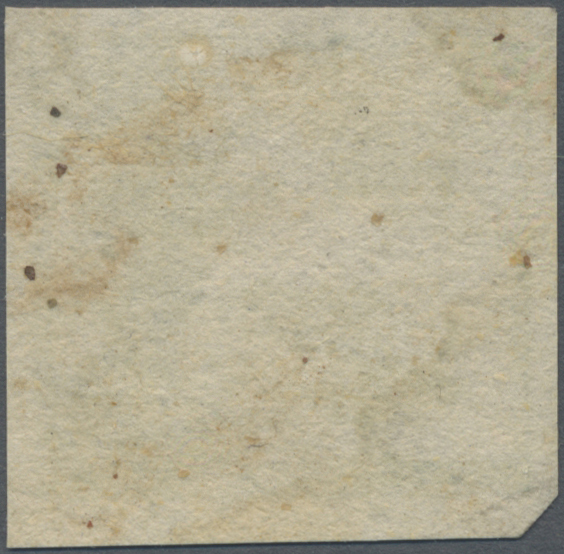 with new value", $1/10c (imperf. 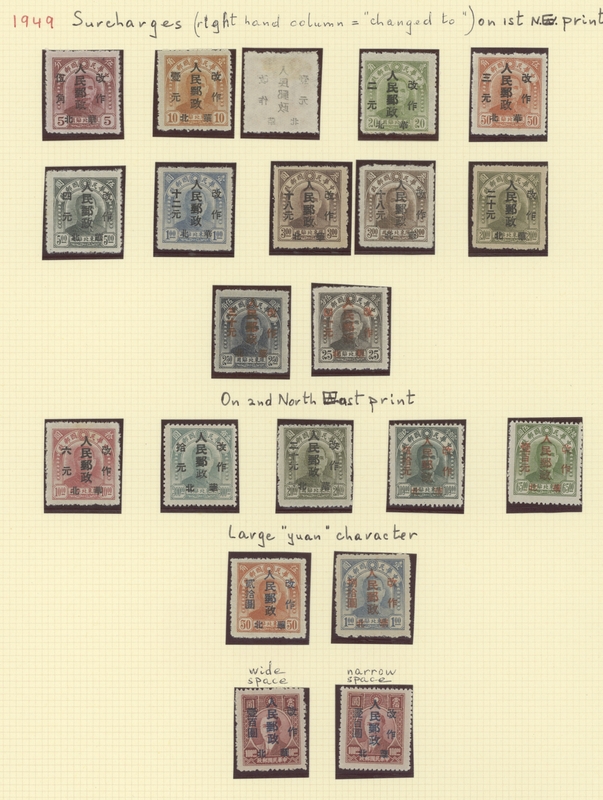 / perf. 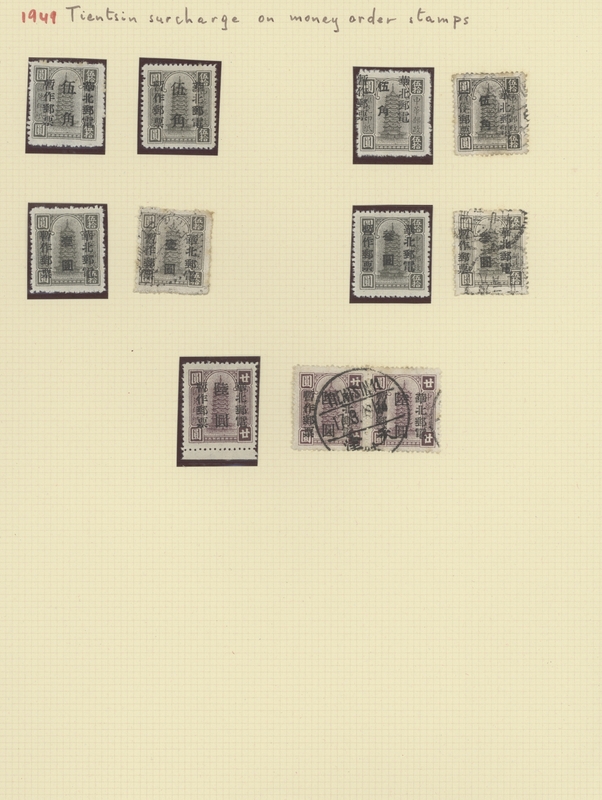 / inverted), unused no gum as issued, fine to very fine, total 3 copies (Yang EC28, EC28a, EC28b). 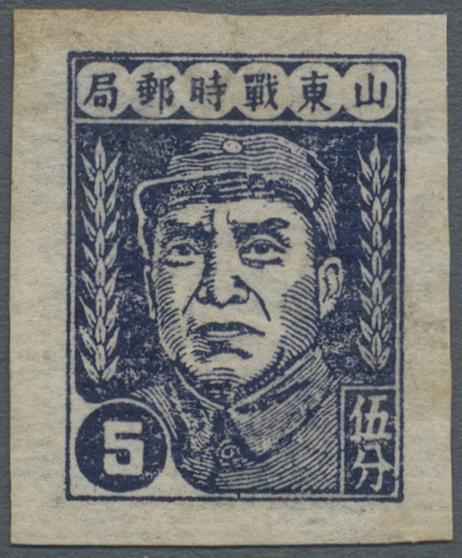 5096 ungebraucht ohne Gummi (unused without gum) (*) East China, Shandong Area, 1944-47, "Mao Zedong Issue of Shandong Wartime Post ovpt. 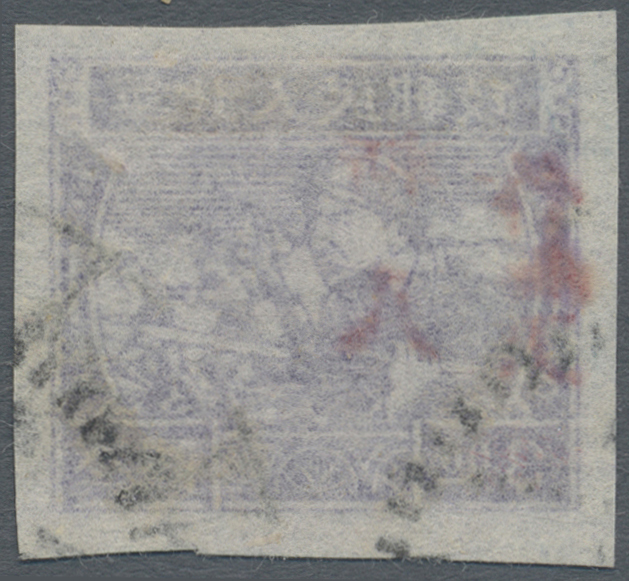 with new value", $2/10c (2 copies) - $5/50c, unused no gum as issued, fine to very fine (Yang EC29-30). 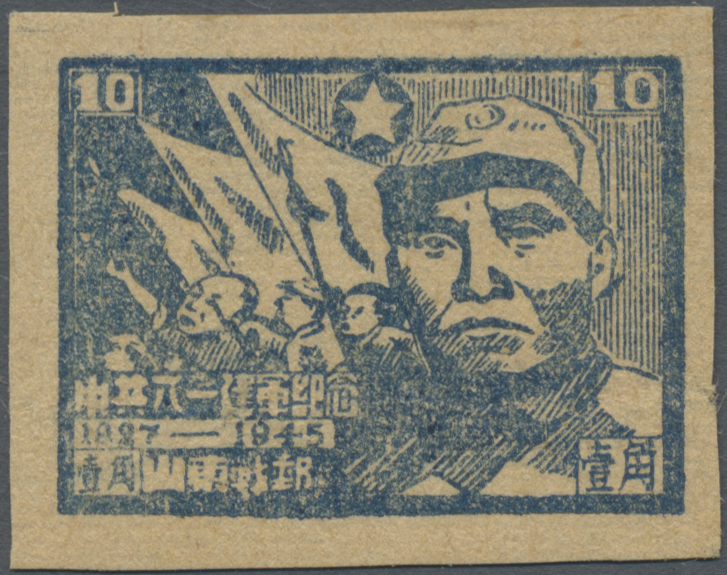 5097 ungebraucht ohne Gummi (unused without gum) (*) East China, Shandong Area, 1944-47, "Mao Zedong Issue of Shandong Wartime Post ovpt. 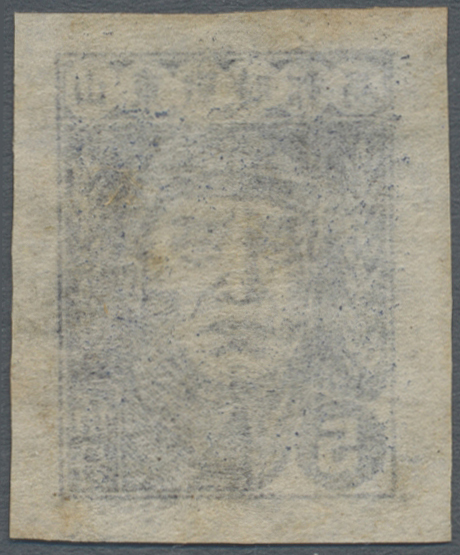 with new value", $5/10c (? 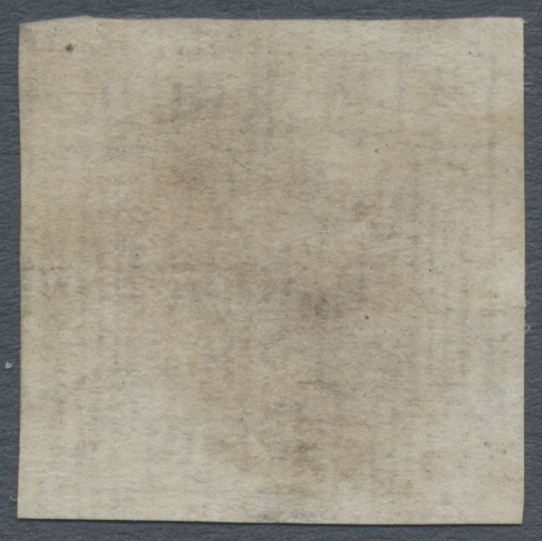 / ? 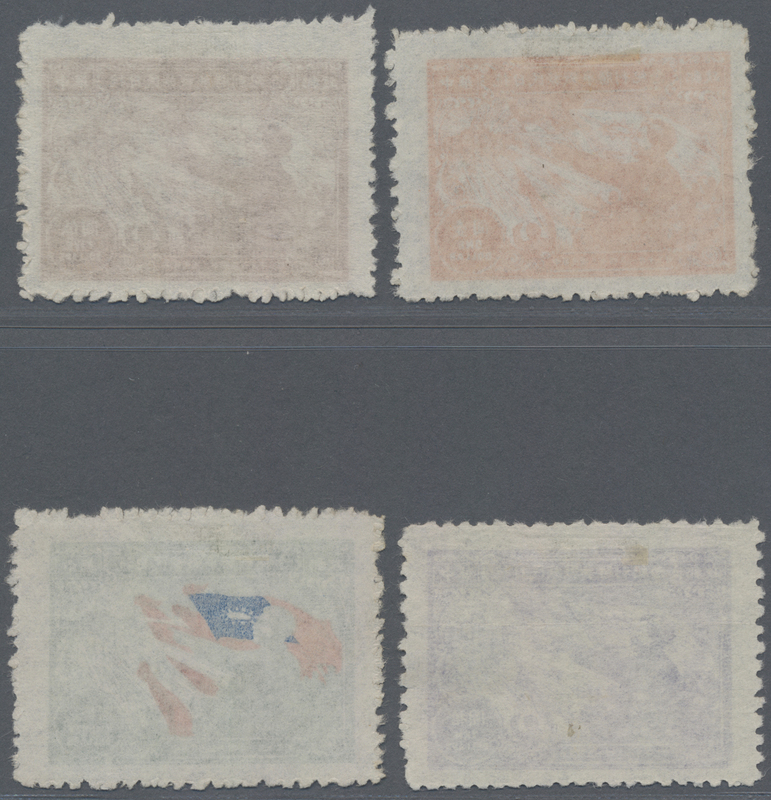 ), unused no gum as issued, $5/10c (?) 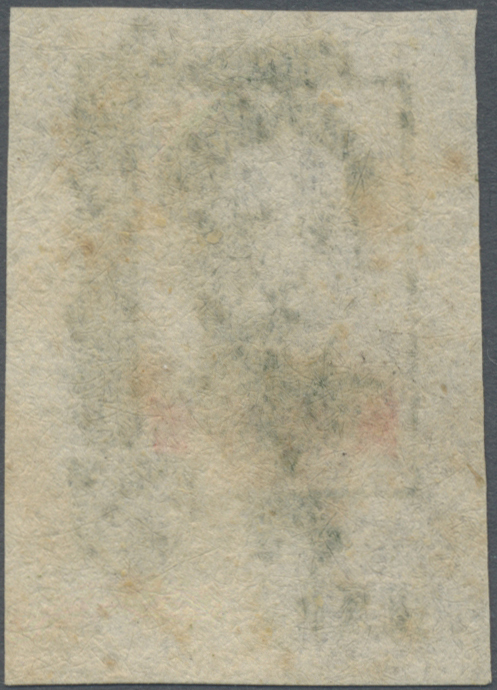 horizontal crease, otherwise fine to very fine, total 3 copies (Yang EC39, EC39a). 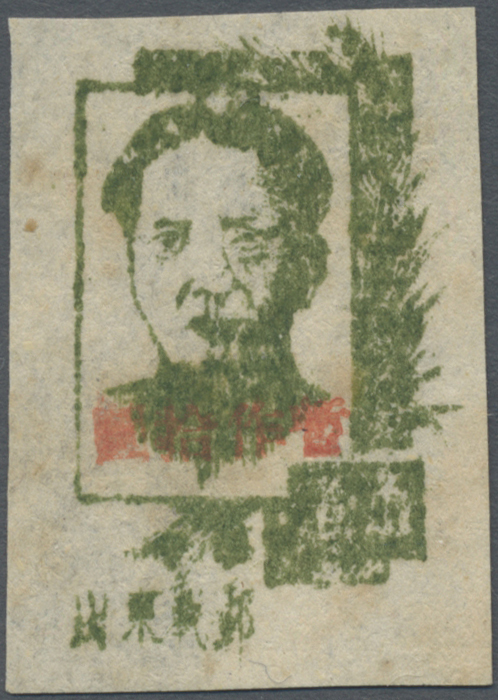 5098 ungebraucht ohne Gummi (unused without gum) (*) East China, Shandong Area, 1944-47, "Mao Zedong Issue of Shandong Wartime Post ovpt. 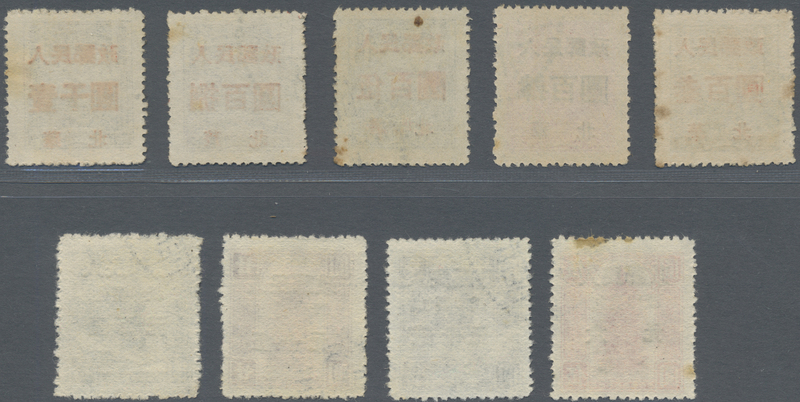 with new value", $10/10c, unused no gum as issued, small toning spots (Yang EC41). 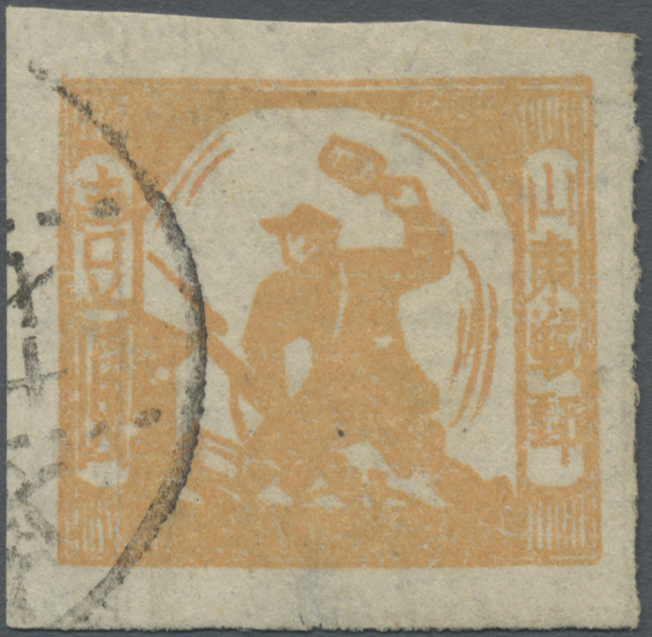 5099 gestempelt (marked) East China, Shandong Area, 1944, "Ploughing and Throwing Grenade Issue", 10c, lightly used, fine to very fine, very rare stamp, we register less than 15 samples (Yang EC42). 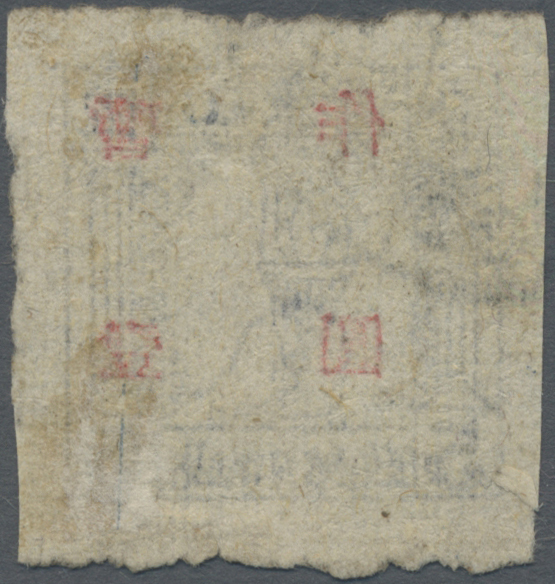 5100 gestempelt (marked) East China, Shandong Area, 1944, "Ploughing and Throwing Grenade Issue", $1, used, fine to very fine (Yang EC43). 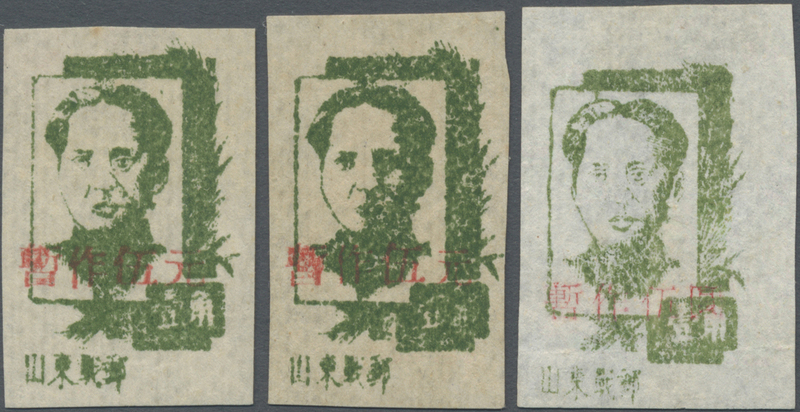 5101 ungebraucht ohne Gummi (unused without gum) (*) gestempelt (marked) East China, Shandong Area, 1945, "Zhu De Issue of Shandong Wartime Posts (imperforated)", 5c (3 copies, incl. 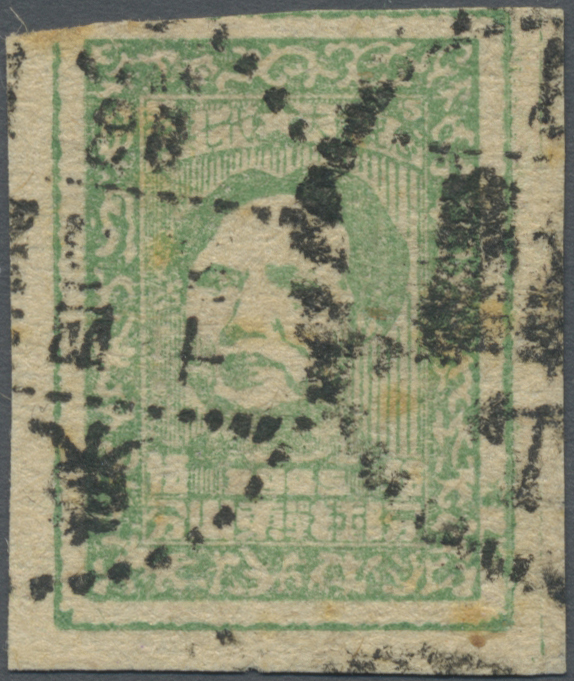 1 used with faults)-$3, unused no gum as issued, fine to very fine (Yang EC45-51). 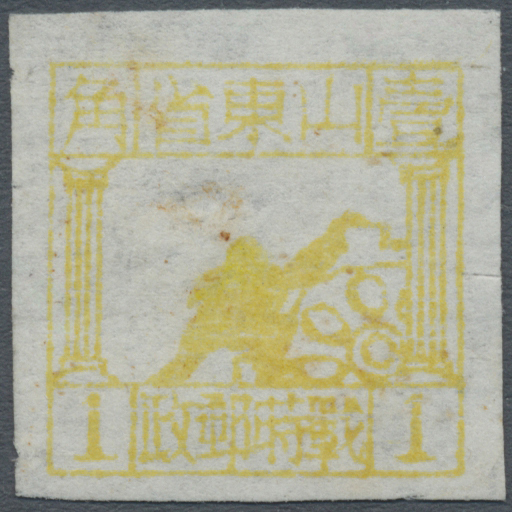 5102A ungebraucht ohne Gummi (unused without gum) (*) East China, Shandong Area, 1945, "Zhu De Issue of Shandong Wartime Posts (perforated)", 10c-$3, unused no gum as issued, $1 yellow lower right corner bumped perf. 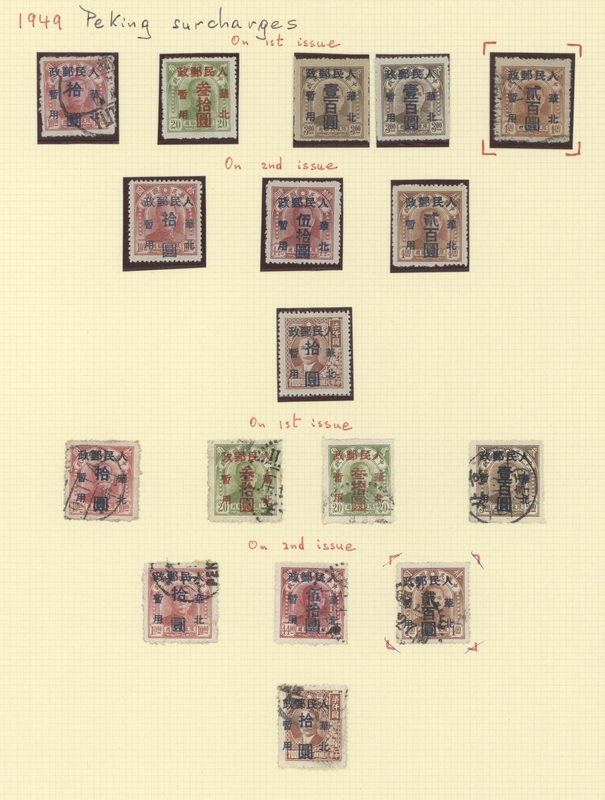 otherwise fine to very fine, total 17 copies (with blocks of 4, varieties), a very rare assembly (Yang EC53-59). 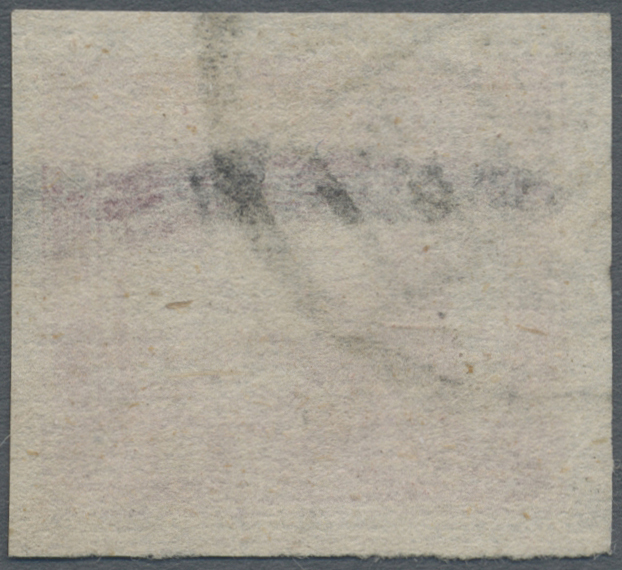 5103 ungebraucht ohne Gummi (unused without gum) (*) East China, Shandong Area, 1945, "August 1st, 18th Anniv. 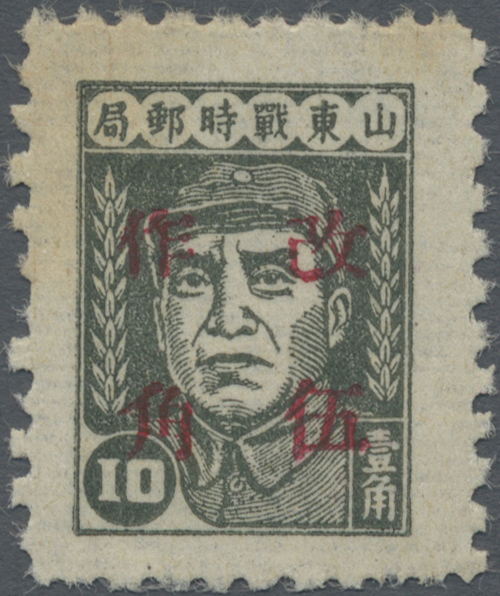 of People’s Liberations Army", 10c, unused no gum as issued, horizontal crease (Yang EC60). 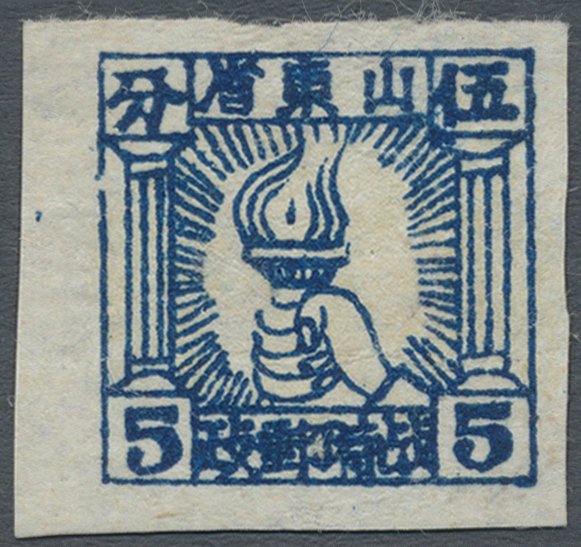 5104 gestempelt (marked) East China, Shandong Area, 1945, "7th Congress of Communist Party of China", 5c, used, cut into design at top, some toning spots (Yang EC61). 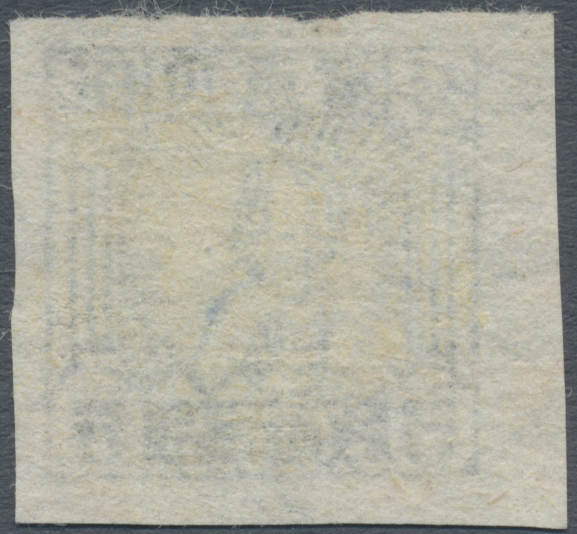 5105 ungebraucht ohne Gummi (unused without gum) (*) 127.) 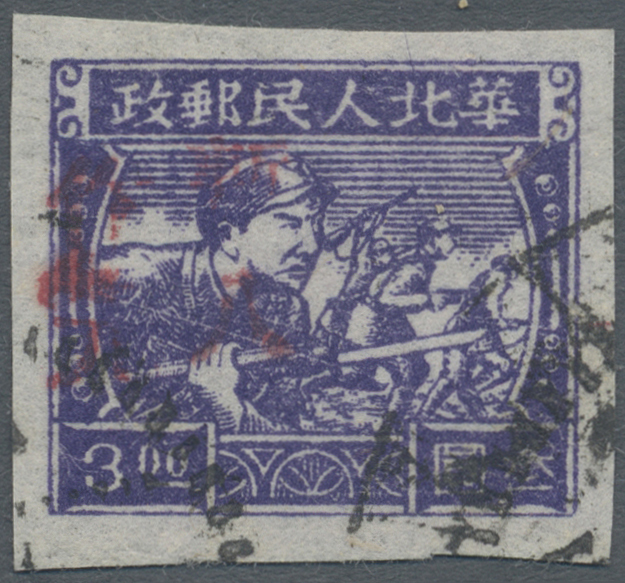 East China, Shandong Area, 1945, "Zhu De Issue of Shandong Wartime Posts ovpt. 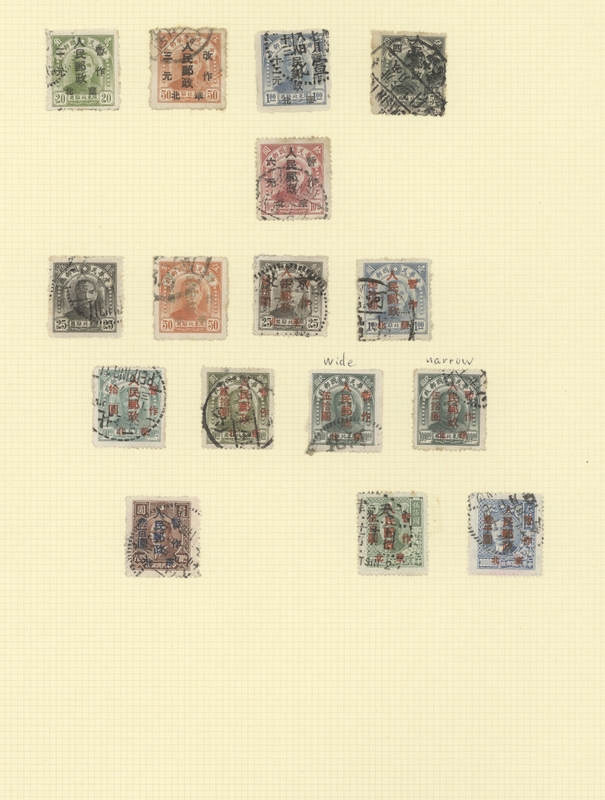 Changed to", 50c/10c, unused no gum as issued, very fine (Yang EC63). 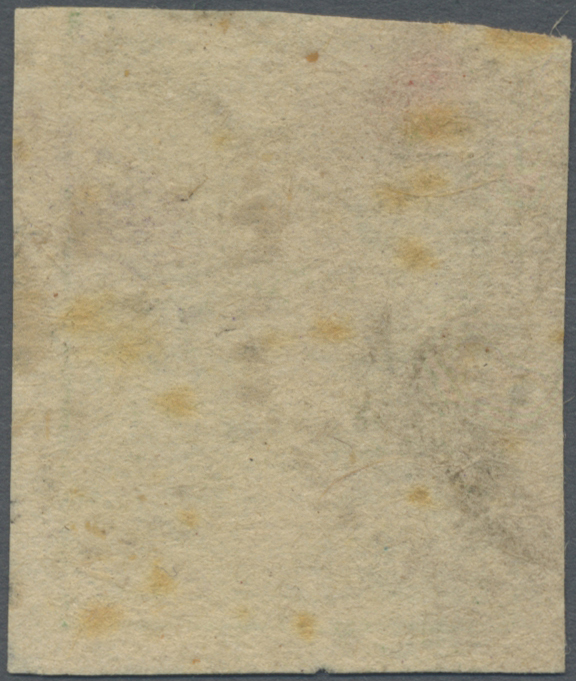 5106 ungebraucht ohne Gummi (unused without gum) (*) East China, Shandong Area, 1945, "Zhu De Issue of Shandong Wartime Posts ovpt. 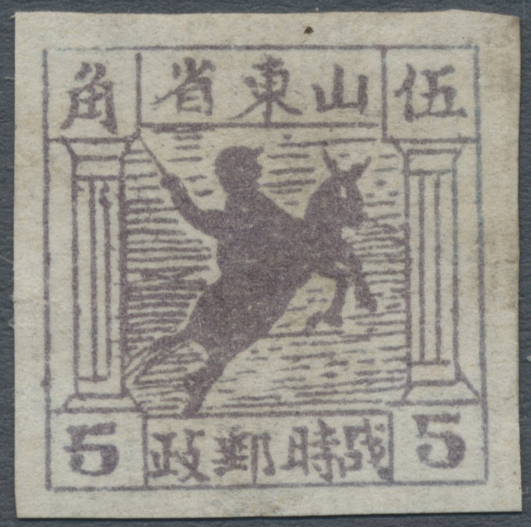 Changed to", 50c/10c - $3/10c, unused no gum as issued, very fine (Yang EC64-65). 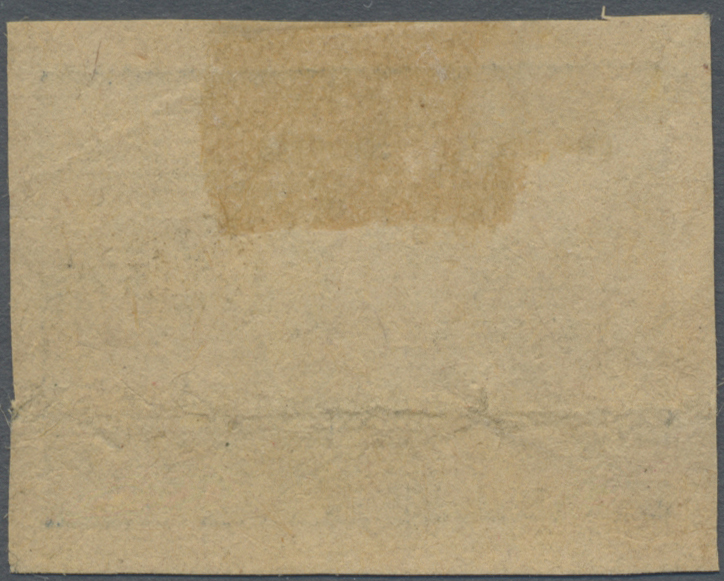 5107 ungebraucht ohne Gummi (unused without gum) (*) gestempelt (marked) East China, Shandong Area, 1945-49, "Zhu De Issue of Shandong Wartime Posts ovpt. 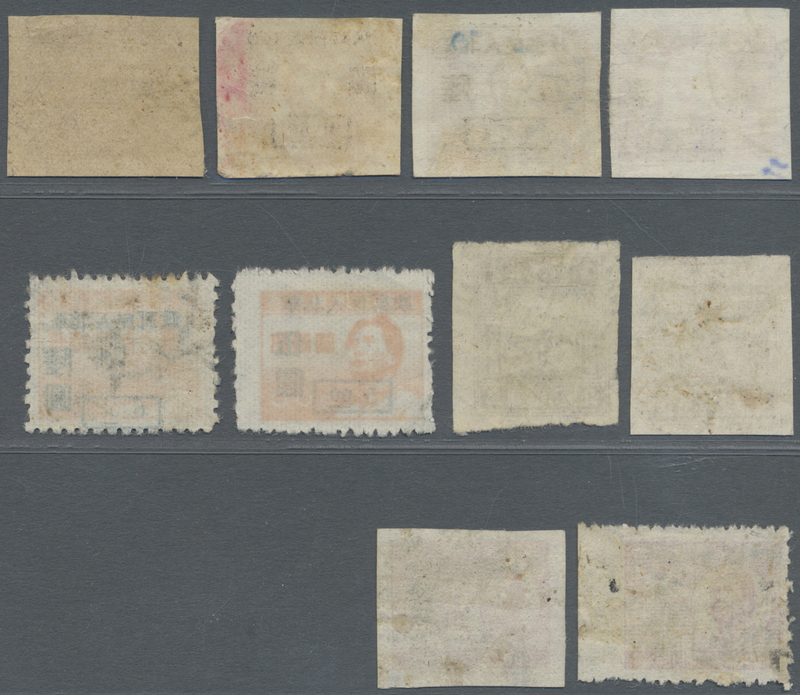 Temporarily Used for", 10c/5c, $1/5c (used, unused), $5/5c, $10/10c, unused no gum as issued, fine to very fine (Yang EC66-67, EC69-70).